Originally published on Mindshift on September 28 2016. Art Lopez’s journey as a computer science teacher began five years ago when one of his high school students asked him a question: “Why do Torrey Pines and La Jolla – schools in more affluent parts of San Diego – have computer science classes and we don’t?” Lopez recalled. Lopez teaches in San Diego at Sweetwater High School, where 85% of students qualify for free or reduced-price lunch programs. At the time, Lopez taught computer applications, but had no experience with computer science. “I tried to take one computer science class in college, but I felt completely disengaged,” he said. Through a colleague, Lopez heard about a new computer science principles course at the University of California San Diego taught by professor Beth Simon. The course was funded in part by the National Science Foundation in an effort to create a more engaging and inclusive curriculum. Lopez used Simon’s curriculum to start Sweetwater High School’s first computer science course in the fall of 2012. Weeks into the year, he learned that the College Board was piloting a new Advanced Placement class called AP Computer Science Principles, designed in part to help close the gender and ethnicity gap in AP computer science classrooms.Of the 46,000 students who took the Advanced Placement exam for computer science in 2014, 22 percent were female. In 2013, eight percentof the test-takers were Hispanic and three percent were African American. 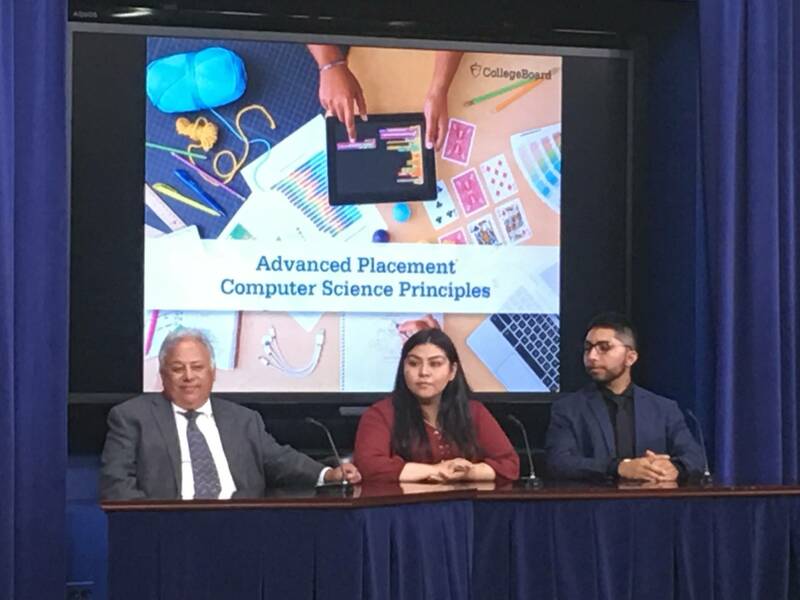 Sweetwater High School computer science teacher Art Lopez and recent graduates Karla Gonzalez and Adrian Avalos present at a Computer Science For All event at The White House. Photo courtesy of Art Lopez. Lopez offers these insights for schools that want to add a computer science program or increase diversity within an existing program. Forge Partnerships: “We didn’t go from zero CS classes to 42 in five years all by ourselves,” says Lopez. His district worked with UC San Diego and NSF to train 55 current middle and high school teachers. Additional teachers attended AP Summer Institutes. Sweetwater is now working with partner districts to create a regional professional network so teachers can help one another out. Actively Recruit Students: Lopez says that one advantage to using existing personnel is that these teachers already know the community and can work to recruit students who may not view themselves as computer scientists. “When my students look at me, they see themselves represented,” says Lopez. He and other high school teachers went into the middle schools to generate interest.